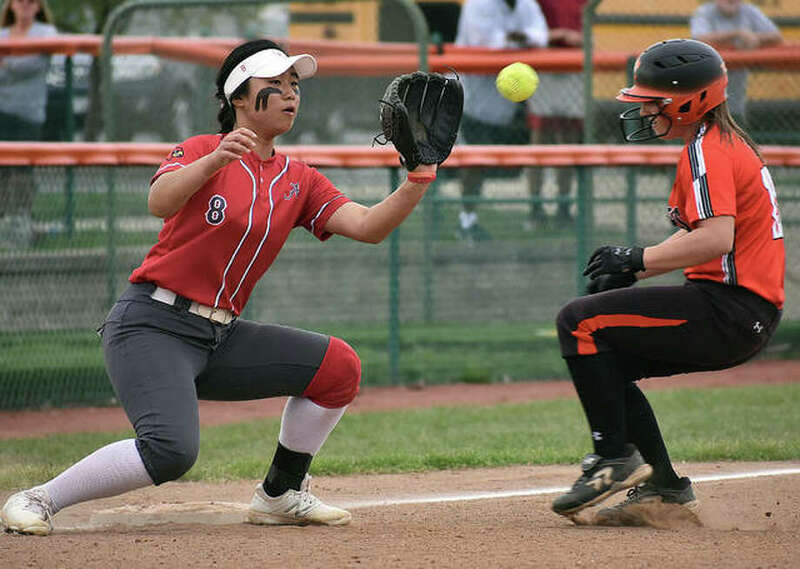 Edwardsville’s Sydney Lawrence (right) scampers into third base to beat the throw to Alton shortstop Tami Wong on Wednesday at the District 7 Sports Complex in Edwardsville. The Tigers went 5-for-9 with runners in scoring position, including a two-out, two-run homer from Maria Smith in a three-run fourth inning, en route to a 5-0 victory over the Redbirds in Southwestern Conference action inside the District 7 Sports Complex. Alton went 0-for-11 with runners in scoring position, and it stranded the bases loaded in the fifth and seventh innings. It was its first shutout loss since losing 15-0 to Edwardsville on May 1, 2018. “The timing of our hits really came together in crucial parts of the game. I’m really proud that we all came together,” said Smith, who went 2-for-3 with a double, home run and two RBIs. It was the seventh straight win for the state’s 10th-ranked Tigers, who are now 10-2, including 3-0 in the SWC. The Redbirds are 9-4, including 3-1 in the SWC. A two-out rally in the third started on a double by Smith, who struck out in her first at-bat. Katherine Bobinski-Boyd walked. Moe Kastens followed with a RBI single up the middle, making it 1-0. Lexi Gorniak then singled to right for the 2-0 lead. Smith now leads the team with four home runs and is tied with Kastens with 11 RBIs. Edwardsville pitchers Kay Swanson and Ryleigh Owens took care of the rest. Swanson started and went 4 1/3 innings. She allowed five hits with three strikeouts. Owens went the final 2 2/3 innings and struck out four. She allowed three hits. Swanson worked out of her biggest jam in the second after giving up a leadoff triple to Scyoc. The Edwardsville pitcher retired Emma Kiger, Audrey Evola and Shelby Kulp via groundouts to get out of it. Tami Wong and Sullivan each had two hits for the Redbirds, who finished with eight as a team. Edwardsville, which had 10 hits, got two hits from Mackenzie Owens and Kastens, along with Smith. Alyson Haegele started for Alton and allowed five runs on seven hits with four strikeouts and a walk in 4 1/3 innings.